Hello! 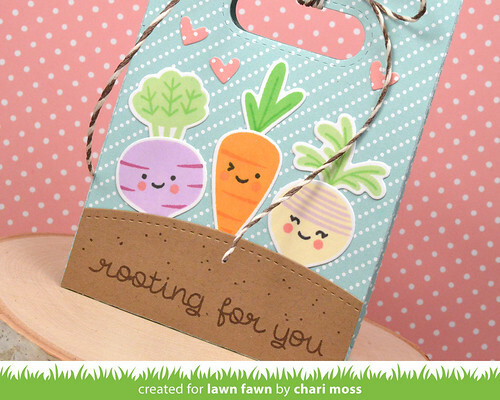 Lawn Fawn Inspiration week continues today with Rooting For You! This set is not only cute but healthy too right? Today I have a goodie bag of veggies to share. I cut a goodie bag from Tide Pool paper from the Pint-Sized Patterns Beachside collection. I stamped out the veggies and cut them out with the coordinating dies and glued the tops to the back of the veggies. 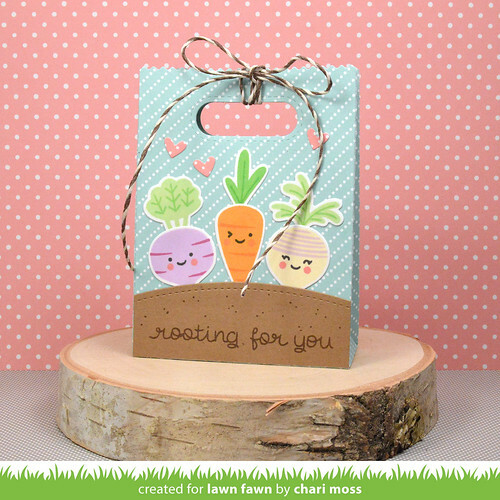 The dirt hill is cut using the simple stitched hillside border die set which works perfect for these little veggies to sit on. I stamped the sentiment with walnut ink and added some brown dots with a brown marker. I added a few little hearts and hot cocoa lawn trimmings to finish everything off. Thanks for stopping by today and be sure to check out the Lawn Fawn blog for more projects with Rooting For You! Such a cute treat bag Chari. So sweet. Gosh! This is so sweet! !